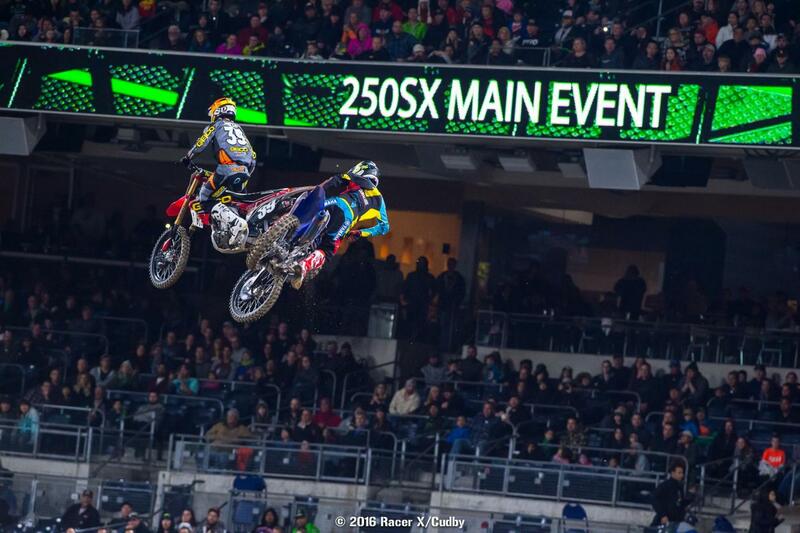 Chad Reed's San Diego magic almost returned tonight, but the immovable object of Ryan Dungey proved just too hard to move, as the duo checked out on the field and traded fast laps all the way to the end. Dungey sliced through traffic with Reed behind him until they were 1.2, and from there the gap stayed between 1-2 seconds the whole way. 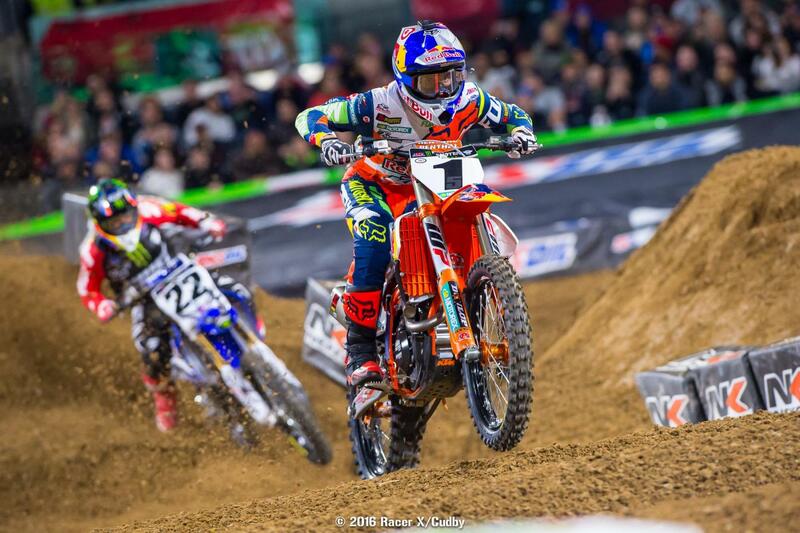 Dungey made a few mistakes and Reed closed, but then the defending champion would pull it back out as needed. Dungey snagged the win, and with it he will retake the points lead. "It was a good race, I couldn't afford a big mistake, Chad was keeping me honest," said Dungey. "Good to have the red plate back." "Hat's off to Dunge," said Reed. "The big sweeper he was eating me up. I'm old but I still love it and I love standing here." (Click here for Reed post-race intervew). Behind them came a big battle for third, and last week's winner Jason Anderson got it, busting through Cole Seely to do it. Seely was fourth ahead of Eli Tomac. Ken Roczen was third early behind Reed but went off the track and down, he recovered for sixth ahead of Trey Canard, while Jake Weimer tuned in a fantastic ride from the back to eighth. 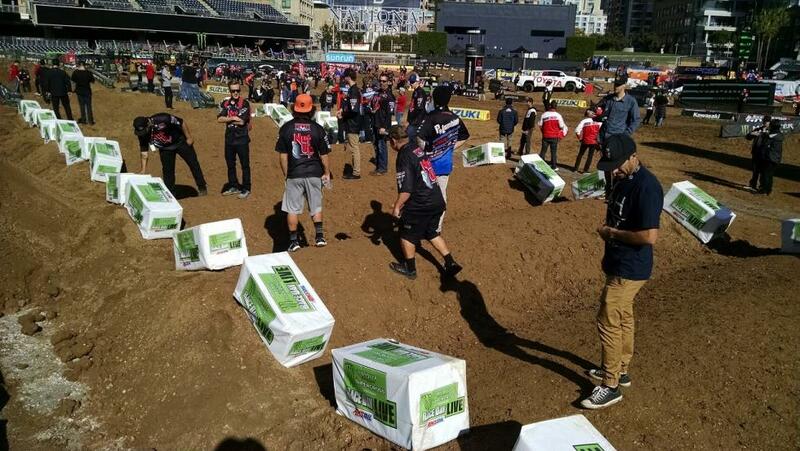 Marvin Musquin and holeshot winner Justin Brayton rounded out the top ten. Click here for 450 highlights. Joey Savatgy was probably credited with the holshot in this one, but it was Jordon Smith who rocketed out with the lead. But right before the finish line he flubbed a jump, allowing riders to close up on him. Jimmy Decotis was on him but he went down in a turn, handing second to Zach Osborne. At this point Cooper Webb was running roughly eighth, but he was making moves in a hurry and forcing his way into spots. Up front Jordon Smith had stretched the lead back out a little bit over Osborne and Joey Savatgy, but Webb was closing fast. Then Osborne caught and found a way around Smith, but it didn’t take long for Webb to get into second and the chase was on. For several laps Webb had his hands full trying to catch Osborne—it wasn’t the quick seek and destroy we’re starting to expect from Webb—but when he did catch him he made relatively quick work of him. Osborne tried to put in a block right before the whoops, but the move resulted in an extremely slow run through the whoops for Osborne and Webb got the spot right back. Osborne would crash a few laps later all by himself and drop a bunch of spots, ending the night in sixth Webb, Savatgy, Smith, Christian Craig, and Colt Nichols rounded out the top five. 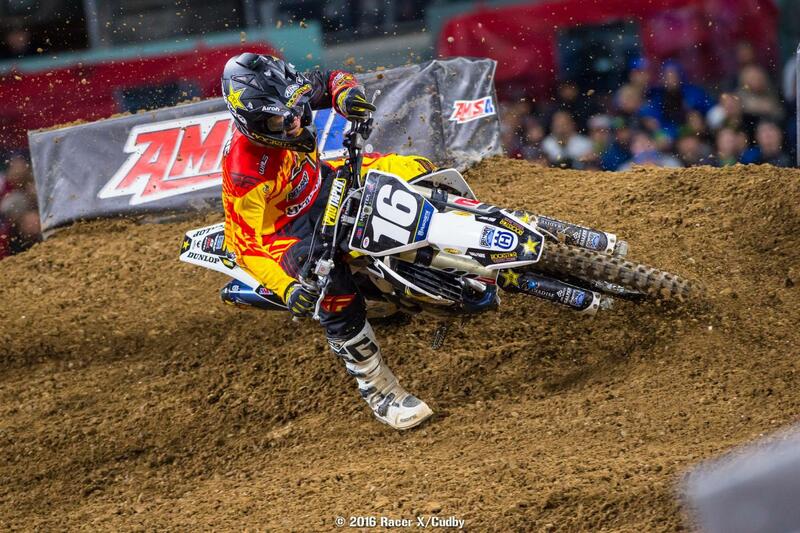 Tough night for Hayden Mellross, who was pretty quick today, but his performance in the main was limited by crashes. Mitch Oldenburg also looked great during qualifying but his night was ruined by a nasty crash. Mitchell Harrison crashed and DNF'd. Click here for 250 race highlights. In 450 action the biggest news was the lack of James Stewart, who was using afternoon practice to decide whether or not he’d be able to race the night program. We now have our answer, as Stewart has pulled out for the day. Ryan Dungey on the other hand, has definitely not pulled out and set an absolutely blistering lap about halfway through the session nobody could beat. There was a lot of back and forth for second between guys like Christophe Pourcel, Ken Roczen, Eli Tomac, Davi Millsaps, and Jason Anderson, but nobody was able to top Dungey. Still, Tomac, Roczen, Pourcel, and Anderson weren’t far behind, and the top ten are less than a second apart. Buckle up folks, tonight’s going to get wild! Cooper Webb kicked the final set of qualifiers off with the fastest time, but there were a lot of guys going fast in this one and it wasn’t long before Mitch Oldenburg, Zach Osborne, Christian Craig, and Jimmy Decotis all beat Webb’s time. Webb retaliated, but it took several attempts before he was finally able to best Oldenburg. When he did, Christian Craig followed, setting nearly an identical time, less than seven hundredths behind. We’re getting reports from riders that this track has great flow, so if Webb gets a bad start he might have a hard time coming from behind like he did last week. One of the biggest questions from last week has already been answered, and if you haven’t heard yet the answer is yes, James Stewart is racing today. Last week's 250 runner up Jessy Nelson is out, though, after a practice crash this week. Another question is if the weather would hold out, and while rain is not expected to fall today or tonight, plenty of it came down last night. Nowhere near what Anaheim experienced in the days leading up to the opener, but it was more than just a little sprinkle last night. That said, the track still looks great, and while it is soft and wet in places, it should come around nicely as the afternoon practice sessions progress. Speaking of the track, initial rider reactions are that it’s not very technical and has better flow than last week. Even so, some riders felt a few of the jump faces were a little peakier than normal, and the whoops are definitely bigger and tougher than last week. Expect the whoop section to act as a bigger separator for some of the guys tonight. Bikes are rolling out now for the first practice so check back soon for a report on the action. We talked to a few riders this morning. James Stewart has passed the concussion testbut tells us he's "going to take his own test" by riding practice this morning and seeing how he feels. If he doesn't feel right, he won't race. We did see him in the first untimed session today and he looked okay, but we'll see if he stays with the program all day and night. Justin Barcia admitted to us that last week's arm pump was based mostly on a thumb injury suffered the Monday before Anaheim 1. "The thumb is bad," he told us point blank. Barcia said he felt like his speed was good last week but he's having a tough time holding on, hence the arm pump. We also talked to Trey Canard, who looked like he was a contender to win last week as he worked his way up to second early in the main. He ended up crashing back to seventh. Trey told us he was happy with the riding but also admitted the first round is always weird, and it almost takes a few rounds before everyone is riding like normal. The 450 class is stacked and deep and anything can happen, but Ryan Dungey somehow made a win look routine against the majority of those contenders. Chad Reed was the only man to give him a challenge, but Dungey was robotic like the Terminator, never wavering much under pressure, and showing no mercy until he and his Red Bull KTM had conquered all. 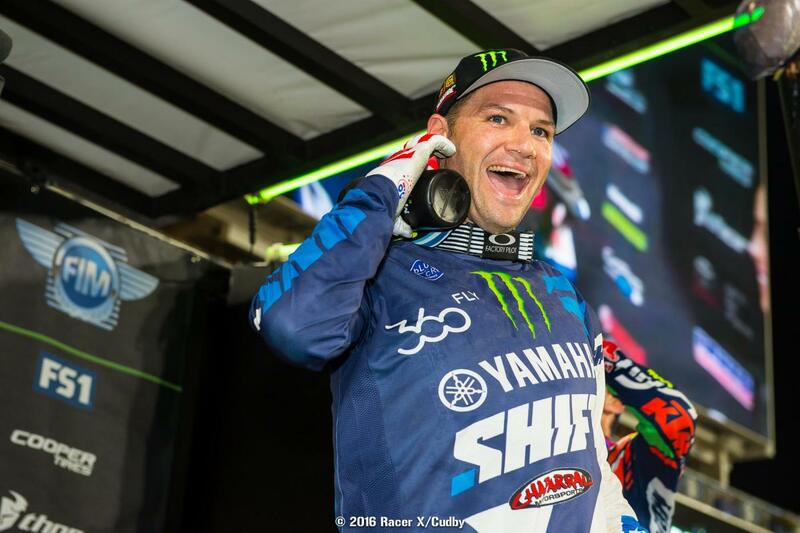 “Having Chad [Reed] on my heels the whole time elevated the pressure a little bit to not make any mistakes, but overall everything felt good,” Dungey told us shortly after his champagne war with Reed. Dungey also told us he thought he had a little more in the tank if Reed tried to press the issue, but didn’t want to push harder unless he absolutely had to. “I think we all had more left in us, but you would have to find the roll speed rather than intensity because the harder you attacked this track the more you would spin and you’d be prone to make a mistake—you’re overriding it at that point. I felt him there but I just tried to keep things clean and tight. I think we all had a little more in us, but it was just such a fine line.” Dungey leaves San Diego with the red plate, something he didn’t give up the whole season when he left with it for the first time last year in Oakland. Dungey’s starts were better than last week and he looked smooth and precise throughout the day, perfectly nailing backsides on some of the difficult rhythm lanes, railing the whoops, just basically looking like a machine. 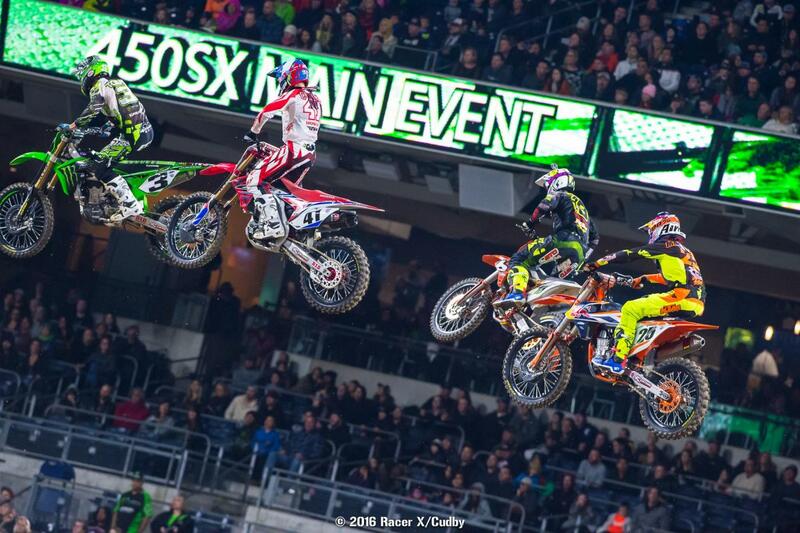 In fact, despite how stacked the field is, Dungey’s robotic performance was downright scary, because it somehow made the night a little boring. 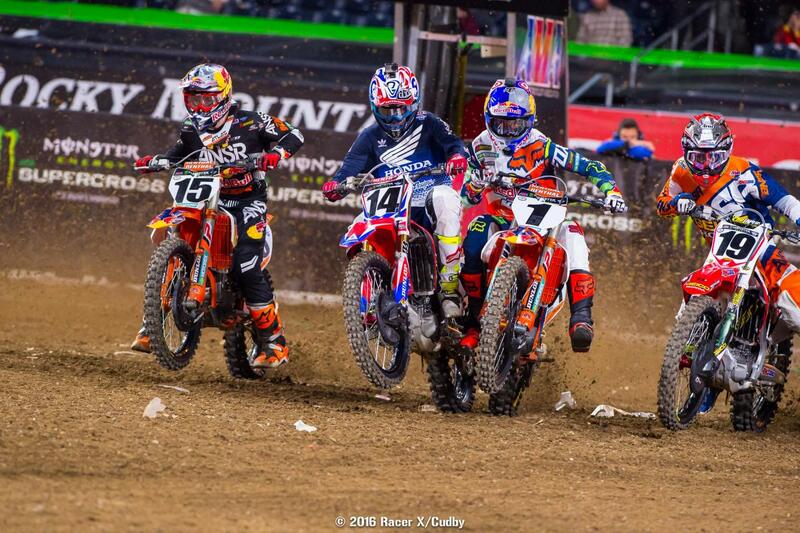 Everyone in this field is good right now, but Dungey rode great. Reed did his best to keep it interesting, following Dungey through in both their heat and the main event, and keeping pace for all twenty laps. Reed was there, about two seconds back most of the way, and Dungey even made a few small mistakes that let Chad get even closer, at one point getting it down to about a second. “I spent 26 laps tonight right behind the champ,” said the Monster Energy/Chaparral/360Fly Yamaha rider, who ultimately came up 1.4 seconds short of Dungey. Last week Chad didn’t touch his bike at all (his mechanic Mike Gosselaar told us they didn’t even change one clicker on the suspension the entire day and night at Anaheim) but this week they did some work, including a ton of starts with his buddy Michael Byrne. Chad felt he left something on the table last week, and this time he was clearly a lot better. He didn’t get the win, but it was another podium for the all-time King of the box, and it appears he’s a title contender again in his 14th season in the class. With Anderson docked back to fifth, Monster Energy Kawasaki’s Eli Tomac gets a bump up to fourth. Just another quiet, risk-free ride from Tomac, exactly what you’d want coming back from injury. Trey Canard was seventh for the second-straight week, but his race was much different. 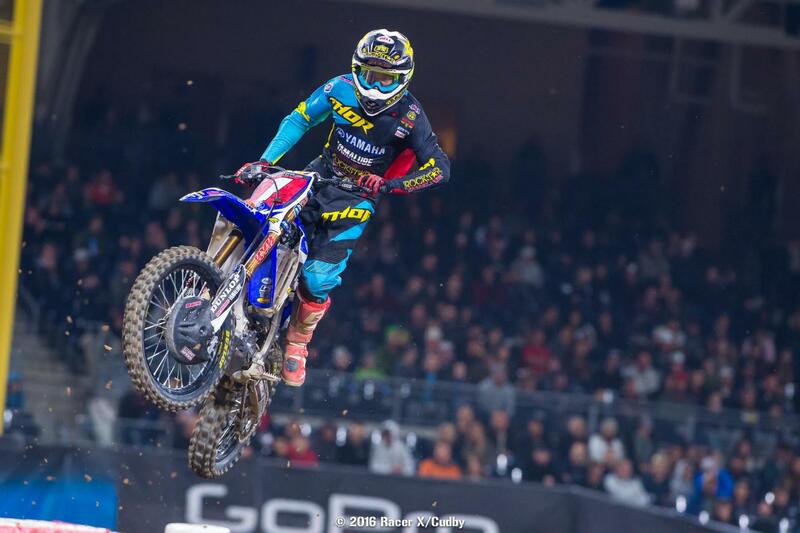 Last week Canard took the fastest qualifying spot and a heat race win and looked to be a main-event contender. He didn’t have the same flash in San Diego, hovering around tenth in practice, having to go to the Semi to make the main, and never quite getting in the battle up front after a mediocre start in the main. 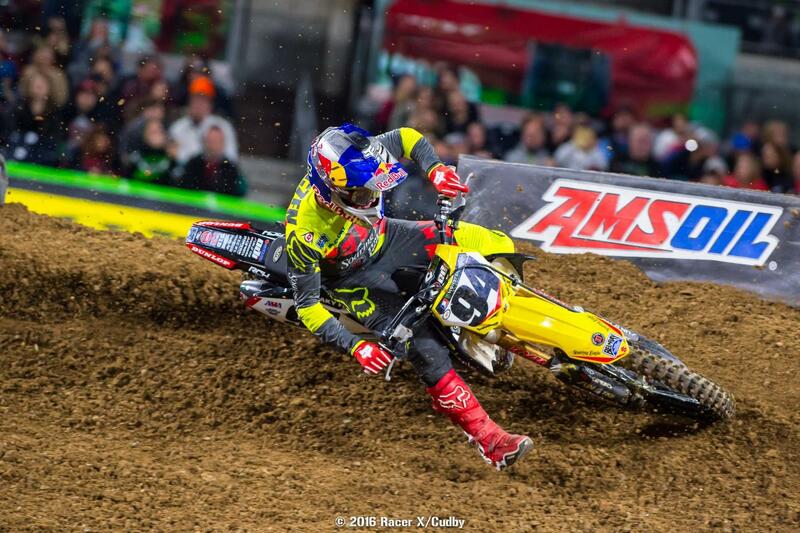 We’ll see which Canard we get for round three in Anaheim next weekend. Once of the best rides of the night came from Monster Energy/Team Tedder’s Jake Weimer, who was eighth and ripping, staying close to Canard down the stretch. We talked to Jake after the race and he told us he just wanted to get through Anaheim, his first race in ten months after a huge injury last year, and then start getting on it beginning in San Diego. Jake says he feels like he’s in a better place mentally in his approach to racing this year. Good ride for Marvin Musquin, ninth on his Red Bull KTM. Justin Brayton rode well, and actually had the early lead on his BTOSports.com KTM after nailing the start, but slipped back to tenth. There’s no room for error against this field early in the season. 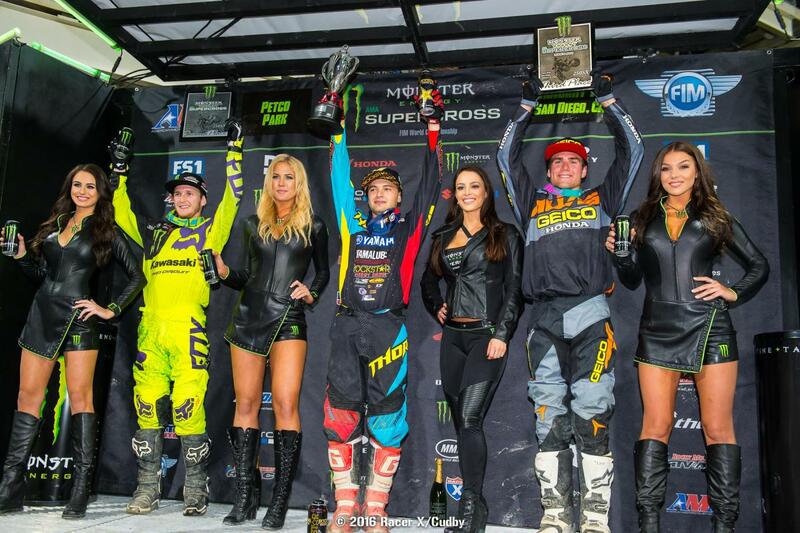 Yamalube/Star Racing Yamaha’s Cooper Webb won the 250 class again, but it was not easy. He gated poorly again in both his heat and the main event, and even had some tangle ups cost him the heat win. In the main he was eighth on the first lap and worked his way forward, but leader Zach Osborne fought tooth and nail to hold the top spot. Webb finally inched up in Osborne and made the pass, but Zach fought back and sliced inside in the next corner. The inside blew Osborne’s momentum heading into the whoops, and Webb quickly had him back. Osborne tried pushing harder to keep up and ended up crashing back to sixth. 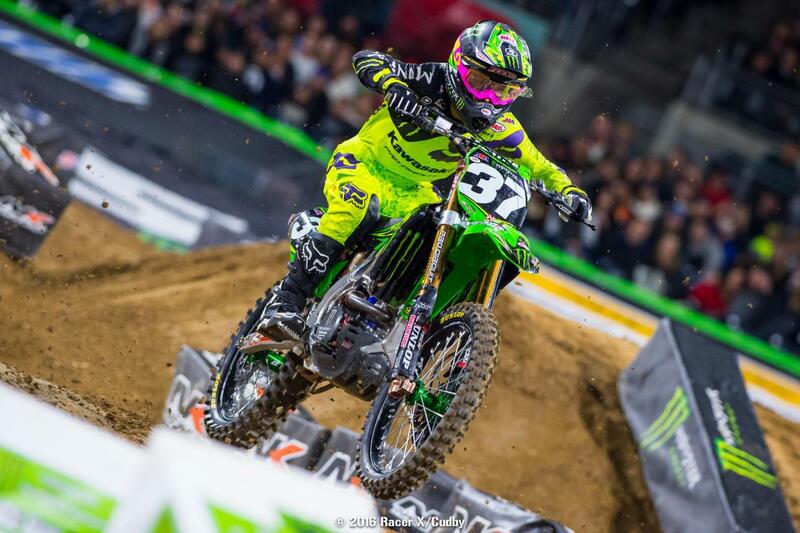 Second went to Joey Savatgy on his Monster Energy/Pro Circuit Kawasaki. It was a much better performance than last week where he got tangled up in the middle of the pack. However, Webb was able to pass him and get away for the win. All of these riders are in for a challenge this year with Webb around. 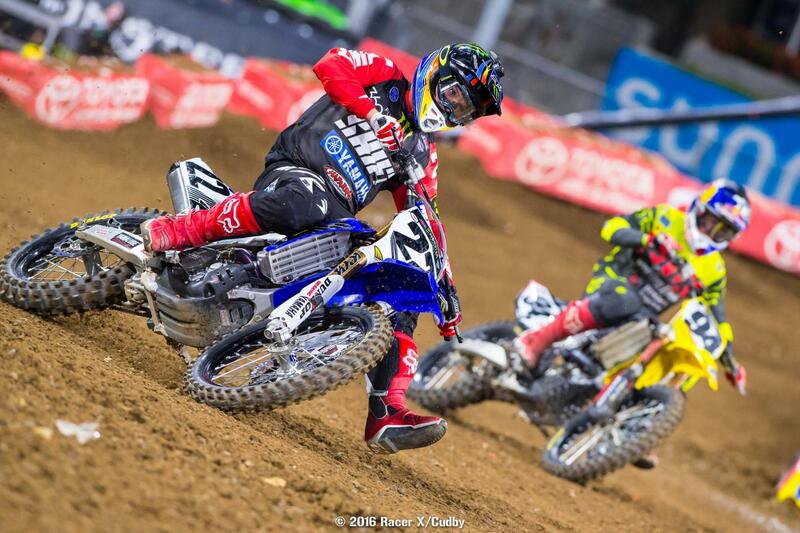 GEICO Honda’s Jordon Smith is trying to ditch the crashing rep this year. 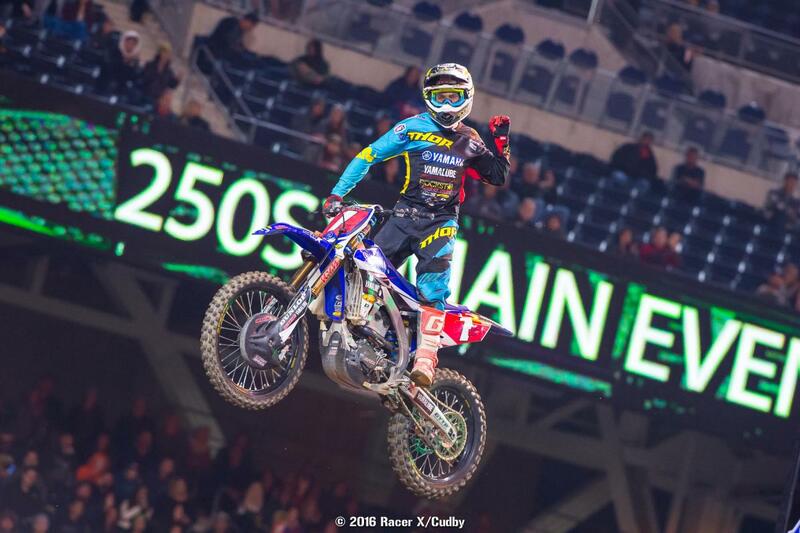 He went down in Anaheim while running in a podium position, but this time he was perfect, keeping the rubber side down and delivering his first career 250SX podium. He’s also second in 250SX points after last week’s fourth. How about CycleTrader.com Rock River Yamaha's Colt Nichols? He's under the radar right now, but if he keeps putting in rides like he did in San Diego it won't be long before people start taking notice. Nichols led laps in his heat and held on for a strong second behind Zach Osborne, and came through a couple guys in the main to log an extremely solid fifth place. Fantasy alert, this guy's a sleeper!